The world’s oceans account for nearly 90 percent of all international commerce. Straits are geographical areas littered across the oceans near land masses that constrict the passage of shipping to narrow passages. 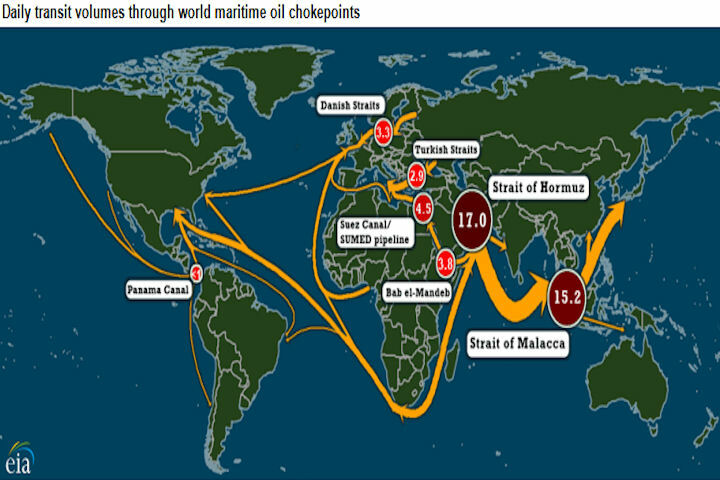 These straits often serve as strategic chokepoints that offer potential control of the world’s sea lanes of communication. Because international shipping lanes are forced to go through these specific vulnerable locations, they are often referred to as the "geographical Achilles heels of the global economy." Many straits are in close proximity to politically unstable nations, which increases navigation risks and compromises access and use. These strategic passages can be mined, blocked by sinking ships, or interdicted by naval forces, artillery or missile systems. 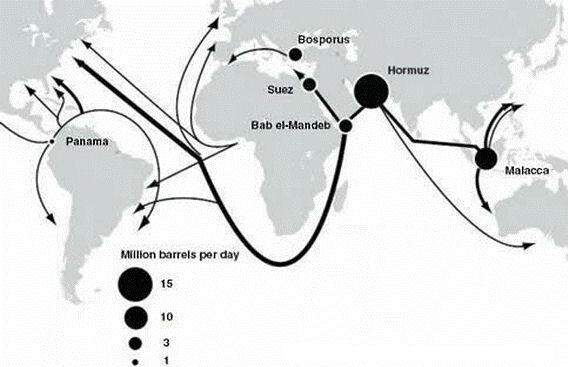 Examples include: Strait of Hormuz – provides transit for 88 percent of all the petroleum exported from the Persian Gulf Strait of Malacca - one of the most important strategic passages in the world because it supports the bulk of the maritime trade between Europe and Pacific Asia Strait of Bab el-Mandeb - a strategic link between the Indian Ocean and Red Sea that controls access to the Suez Canal, which in turn accounts for 14 percent of global commerce Passages of Bosphorus and Dardanelles – the only links between the Black Sea and Mediterranean Sea, thus one of the few passages for commerce and petroleum from the Caspian Sea to the Mediterranean community Panama Canal - handles nearly 12 percent of the American international seaborne trade. To be effective, U.S. armed forces must be where required, when required. They must be capable of moving within and between areas of operations in times of developing crises. To carry out assigned missions, U.S. naval units are continuing to experience a brisk operational tempo. For example, on any given day, about 50 percent of U.S. Navy ships are at sea; about 30 percent are deployed in the Adriatic, Mediterranean, Red Sea, Persian Gulf, and Western Pacific. As naval and air forces move within and between areas of operations, they must pass through critical choke points. Additionally, U.S. naval forces may have to pass through the territorial seas of one or more coastal states. The Convention plays a crucial role in enabling the United States to achieve the necessary mobility and operational flexibility by providing the assurance that key lines of communication and operating areas will remain open as a matter of international legal right, principally through the rights of transit passage and innocent passage. Under transit passage, ships and aircraft may transit through international straits freely in the normal mode, without prior notice or authorization. This means that submarines may transit submerged and aircraft may overfly without filing flight plans or obtaining diplomatic clearance. Units also may transit in a manner necessary for the security of the unit or the force, such as formation steaming, launch and recovery of aircraft, and flight operations, consistent with sound navigational practices. Also important for the Defense Department's operational needs is the right of innocent passage, which provides that all ships, including warships, regardless of cargo, armament or means of propulsion may, as a matter of right, pass through the territorial sea of a foreign sovereign, without prior notice or authorization. The naval protection of commercial shipping has traditionally beenassociated with the assurance of free passage through important, narrow sea lanes –“choke-points.” The ability to pass freely through these points, or to deny such passageto adversaries, has long been recognized to be an important element of national power. Through the end of the nineteenth century, European powers fought or threatenedwar over the control of choke-points, most famously the Turkish straits and Suez. Control of the sea can be accomplished through decisive operations by: Destroying or neutralizing enemy ships, submarines,aircraft, or mines; Disabling or disrupting enemy command and control; Destroying or neutralizing the land-based infrastructurethat supports enemy sea control forces; Seizing islands, choke points, peninsulas, and coastal bases along the littorals; Conducting barrier operations in choke points that prevent enemy mobility under, on, and above the sea. It is impossible to contemplate the map of the globe without being struck by a strange coincidence in the conformation of the eastern and western hemispheres—the attachment, in both alike, of the southern continent to the northern terrestrial mass by a neck of land so narrow that it may be crossed in a day's ride from sea to sea. Yet these slender causeways of Suez and Panama imposed a detour of thousands of miles on European commerce with the far East and the far West, compelling it to double the two great southern peninsulas in order to reach the further seas beyond. The great ship canals of the world are for the most part those constructed through isthmuses with the object of shortening trade routes. The construction of the Suez Canal, opened in 1869, shortened the distance from England to Australia by 1,000 miles; but as the dues charged were at first so heavy, it was only used by vessels carrying mails and cargoes requiring rapid transit. It is about 100 miles long, and runs from Port Said on the Mediterranean through Lakes Menzaleh and Timsah, and the Bitter Lakes to Suez on the Red Sea. Initially it could be used by vessels of 28 ft. draft, as it has a depth of 34 ft. Empire always followed on the track of commerce, and the Mediterranean basin remained its seat, while that inland sea continued to be the sole highway to the East. The simultaneous discoveries of the sea-routes to India and America transferred its sceptre to the Atlantic seaboard, and the ocean Powers during the succeeding centuries monopolised the wealth and dominion of the world. The creation of an artificial strait at Suez tended to lead Eastern commerce back to its ancient channels, restoring their old prosperity to the Mediterranean cities at the expense of the ocean ports. The Panama Canal was constructed by the United States primarily for naval purposes. It will shorten several trade routes, particularly the South American route connecting the Atlantic and Pacific ports of the United States and Canada, and the trade between these centres will probably be revolutionised in consequence. The canal is being cut across the narrow isthmus of Panama in Central America from Colon on the Atlantic to Panama on the Pacific coast, a distance of 40 miles, with a minimum depth of 41 ft. The Kaiser Wilhelm or Kiel Canal, by cutting through the peninsula of Schleswig-Holstein, connects the Baltic ports of Germany with her chief North Sea ports, and shortens the distance between England and the Baltic by about 240 miles. It is 61 miles in length, running from Kiel on the Baltic to Brunsbiittel, near the mouth of the Elbe. The depth is 29 ft. The Manchester Ship Canal was constructed to enable vessels to bring their cargoes of cotton inland to Manchester, and so avoid re-handling at Liverpool. It runs from Eastham to Manchester, and is 35} miles long and 28 ft. deep. The Corinth Canal, cut through the Isthmus of Corinth, shortens the distance between the Ionian and jEgean Seas. It connects the Gulf of Corinth with the Gulf of iEgina, and is 4 miles in length. The Projected Kra Canal would diminish the distance between Calcutta and China by about 700 miles, and that between Burma and Bangkok by 1,300 miles. It was to be cut through the Isthmus of Kra between 10 degrees and 11 degrees north latitude.